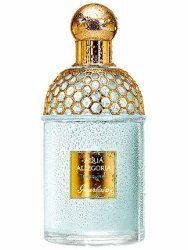 Teazzurra is the latest in Guerlain's Aqua Allegoria series, which used to be a reasonably-priced, youth-oriented range showcasing natural materials. I mostly think of it now as where Guerlain keeps their white-musk-dominated "fresh" scents, as opposed to the sweet gourmands1 and Shalimar flankers that dominate the rest of the brand's output. Anyway, Teazzurra is a completely harmless, very fresh tea, with a little tiny sliver of citrus in the opening and, for a few brief moments, an interesting flash of aromatic / herbal character presumably lent by the chamomile (other notes: bergamot, yuzu, lemon, grapefruit, green tea, jasmine, musk and vanilla). It is flattened soon enough by the overwhelming freshness of perfumer Thierry Wasser's otherwise soft and sheer, mildly watery composition. Underneath it all, you'll find a likewise-sheer dusting of sweetish vanilla powder. That's it. What you smell after about 20 minutes is pretty much what you'll smell for the duration, and it does last for hours and hours. Verdict: If the sparkle of Bvlgari's Eau Parfumée au Thé Vert is simply too much,2 or if you need something that will smell enough like air freshener to get past the stringent anti-fragrance policy at your place of work, Teazzurra might be perfect for you, and indeed, many of the reports I've seen have been positive. With the usual apologies to any fans, it is my least favorite Aqua Allegoria yet. The poll: what's the most "meh" fragrance you have smelled so far this year? Guerlain Teazzurra is available in 75 ($65) and 125 ($90) ml. 1. I was interested to learn, via Monsieur Guerlain's Facebook page, that Guerlain thinks La Petite Robe Noire is simply not sweet enough for the North American market and is planning a sweeter version just for us. You have been warned! 2. I should mention that I have not smelled a new bottle Eau Parfumée au Thé Vert in quite some time, and for all I know it has been reformulated to death by now. Seriously though, I can’t remember the last time I was excited about a new Guerlain. Very disappointing. We got to try that Guerlain at Sniffapalooza- not sure where Luca’s coming from with that review. Le Bouquet smells nothing like Angel, and I’d definitely rank it higher than 1 out of 5. It’s a perfectly pleasant sweet orange blossom. I did see the one about La Bouquet — very entertaining! A fragrance house with a menu composed of clean white musks on one side and sweet orientals on the other … what to do? Just continue ignoring Guerlain’s offerings, except for my summer staple Herba Fresca, I suppose. I don’t get out much, so I have nothing to throw into the “meh” pot, I’m afraid. In the summer, Anisia Bella is my favourite AA. In the winter, Winter Delice is. We are not so picky, of course it counts. There are way too many “meh’s” to count (or remember), I’m afraid! Great review, as always! “A blur of meh” is a brilliant way to put it! We’ve sold exactly one of these in the months since Teazurra arrived in my Nordstrom fragrance department. Let the record show that The Shoppers of Nordstrom Montgomery don’t seem too impressed, either. I’m happy to report that Pamplelune is doing quite nicely, though! Hey, did not realize you were at Montgomery Mall…that used to be “my” mall, many moons ago. I liked Emozione better than you did, but it’s not genius. And have not tried the AG yet. It’s a small perfume world! Montgomery Mall was the “nice” mall we went to if we wanted to hit up the fancy stores, since there weren’t any of those in PG County! Their starting to push the EDP of Bleu de Chanel in men’s magazines and in department stores so I think it can count as my “meh” of the year so far. Though I’m preparing for the meh that Balmain Homme is gonna be! Gosh, hope not. But it’s probable. It’s not this year, but it’s the most recent fragrance I tested at Ulta – Armani Si. It’s not awful, but it’s a bit of a dull fragrance for such a big firm. And, I don’t really care for big peach in my frags. I really don’t get too excited about any of the day to day new releases (except that Tauerville vetiver you just posted today). I expect to be very dissapointed and mostly try and think about older frags or the ones I already have. My fav Guerlain right now is their classic Vetiver which just about makes me want to swoon. Put that in a bee bottle! Vetiver is wonderful…I could have worn that for Flirty Friday too! I sniffed that recently when I was in Macy’s – my only thought was, that’s really sweet! Too bad since I like the bottle. My reaction was very similar, although I thought there where some nice notes pokig out beneath that synthetic, smothering, chirpy freshness. Other mehs for me: Frederic Malle Cologne Indelebile, Clinique Aromatics in White and Serge Lutens L’Orpheline, although the latter was technically 2014. And these are only the ones I had any expectations about. I tried to convince myself to like the Magnolia, because I loved the idea of that perfume. I bought a bottle for my boyfriend and it smelled nice on him, but despite several attempts, I never enjoyed it on myself. I agree, Rose Privee was a disappointing meh, but because L’A brought back Tea for Two and Oeillet Sauvage, I am forgiving ! I smelled Teazzura, Aromatics in White, and L’Orpheline at the duty-free in Gatwick last month, and I cannot remember a single thing about any of them. Absolutely featureless. Welcome to the future of perfumery. Clean is bound to go out of style eventually, although whether it will be replaced with anything better is obviously far from certain. I know, right? Like there are too many regs for dirty, stank, mossy, spicy sweat bombs. Even noir scents don’t mean anything..or intense ones. I expect every scent to be candy floss..then the end will come. It is written. Errr… Chloe Love Story? Was that 2015? Not that I was expecting much, but it was fairly mind-numbing. Actually, I’ve found it a fairly dull year so far, especially on the department store and larger niche line fronts. I am behind, have not even smelled Love Story! There have been so many mehs! Everything I’ve smelled in a magazine has been a disappointment. Love Story by Chloe was pretty boring/awful. Most Meh is definitely Oxymusc by A Lab on Fire. Seriously, bottled air. Too many mehs (snark). Reveal, De Profundis, Bois du Portugal and that Colin Ferrel scent, for some reason..I was expecting something with Colin Ferrel fronting it to be good? Idk why? LOL And no, it’s not cuz I ‘like’ him. Polo Red was a dud too. So, so many. Oh ya..and the 600 dollar Lutens…whatever! Kenzo Jeu d’Amour. Though I might deserve a bleh. Not that anyone was expecting a deathless classic from the Haus of Gaga, but I thought her first scent wasn’t terrible (nothing special or artistic but no worse than most celebuscents): when I smelled Eau de Gaga a couple of weeks ago I literally thought, “Really? That’s IT?” There is nothing to it. It’s a boring bottle full of liquid meh. We are opposites I guess — I don’t like either, but I thought Eau de Gaga was way better than Fame. Yeah, I remember reading your review and thinking, oh, I’ll definitely have to try that when I run across it. I confess to having bought the small bottle of Fame when it went on clearance: the bottle is kind of snazzy, the black liquid is novel, and some days you want to smell cheap. (I really have worn it a half dozen times or so.) But if someone gave me a bottle of Eau de Gaga, I would just give it away. I guess we ARE opposites! Sort of opposites, except I’m not going to buy Eau de Gaga & wear it! I don’t know why I peaked my expectations but was very bored by CK Reveal. There were some reviews out there that made it sound edgy and interesting but my nose found nothing like that in it. Ho hum. I had extremely low expectations so it was surprisingly nice to me…not edgy at all, but better than the usual from CK. So it’s all about the expectations, right? Absolutely. More than a few experiences couldn’t help but disappoint based on the lofty anticipation. And just as many magnificent surprises when going in with no expectations at all. Yep. 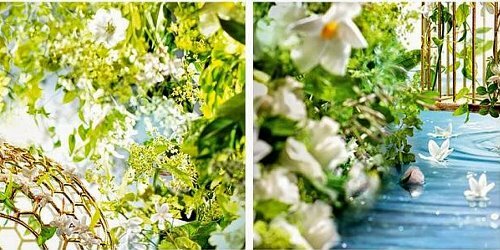 My high expectations for Misia–because of the Chanel house and the folklore around Misia Sert just killed that fragrance for me…total meh. Oh yes, Misia..the first Exclusif meh for me. I love so many of the Chanel’s but Misia was meh for me, as well. Robin my biggest recent Meh (for the price!) was Frederic Malle’s Eau de Magnolia. Perhaps sniffing it by the “scouters” was what struck the deal with Estee Lauder. Must have reported back to the CEO: “We found a niche brand for you to acquire. They make scents that smell like harmless mainstreams. Perfect for our business expansion”. I know you liked Eau de magnolia. Sorry couldn’t help it though. You might be thinking of Kevin, he reviewed the Magnolia. I think it’s nice enough but massively overpriced, and I doubt I’d buy it even if it was much much cheaper. The latest Shalimar flanker, the blue one. I’ve so far only smelled it on paper, but it left an impression of every mainstream fragrance released in the last five years, all stirred together and bottled. I remember the disappointment from Guerlainophiles when Idylle was released several years ago. That one is starting to look like a masterpiece now. In fact I’ll say hi to it as I walk past the G. counter today, just to see how it’s doing. Totally agree on the meh-ness of blue Shalimar. Actually…I found it slightly unpleasant. That was also a meh..but a meh that’s growing on me..idk why must be the bottle. Like anything in a bottle like that can’t be *that* bad. lol maybe I am looking for excuses to get the bottle…but idk, it’s growing on me. You’ve compared Pamplelune to cat pee. If this if your least favorite Aqua Allegoria…Ouch. I didn’t like it either. When I first sprayed it I thought, “Oh, I must have mixed these up. This is the Caipirinha one.” But I hadn’t made a mistake. It was just another sweet, refreshing, citrus, blah, blah, blah. The most meh scent this year? Almost everything I’ve tried. I’ll submit my vote for the re-released trio of Jo Malone Blossoms because they’re current, but nearly everything I’ve tried recently has no spark. In the past week: BV Knot, eh; Fleurissimo, meh (seriously, privately commissioned by royalty? ); Caleche, eh; Cristalle edt, eh; Aerin Lilac Path, nice for a second, then meh. I think I’m in a rut. Oh dear, but wasn’t really meaning to “count” Pamplelune — it does smell like cat pee on me, but I recognize that it doesn’t smell like cat pee on the people who love it! Have you loved anything you’ve tried this year? Not really. I bought Jo Malone Birch and Black Pepper a few months ago. I admire it for being different and having amazing lasting power for a JM, but sadly I can’t say it was love. It was extreme like combined with being able to recognize a limited edition that would sell out soon. I do think that I will enjoy it more in the fall and winter than I do right now though. I also got a travel spray of Atelier’s new Magnolia scent. I like that one a bit more, but the totally reasonable bottle size and price influenced that purchase. I don’t think I would have shelled out $$$ for a full size. I’m a bit behind on new releases after having a baby and a pregnancy nose that stuck around for an extra eight months. I was so irritated by most perfumes that I stopped trying for awhile. (That and the fact that I had no time to shop.) Are there any standouts from the past year or so that I should go out of my way to find now that I’m getting back into the game? Jo Malone +1..when I went to sniff the Jo mo collection…they were all meh..then I saw someone buying two large bottles of..I think it was English Pear and Freesia..and was like..oh why would ya do that? Two bottles…because you have to spray twice as much to be able to smell it! Just kidding. There are several JMs that I like, but very few are from the last five years or so. I also think they make great bath products and so-so perfumes. I do enjoy playing around with them though. It’s fun to mix and match to come up with different concoctions. I LOVE your snarky reviews, Robin! The snarkier the better! Ever since Iris Ganache, I think it’s been all down hill with White-musk Wasser. Such a shame as I’ve been a big fan of Guerlain since my first bottle of Vol de Nuit in high school. Nothing comes to mind as I do very little sampling anymore, but nothing has gone on my “to buy” list either! I don’t blame Wasser, I assume he is doing what they want….but would have to agree with the downhill slide. I liked the the oriental ones though, Rose Nacree de Desert and Encens Mythique d’Orient. They’re not meh at all I think. I’m going to nominate that new Amen in the orange flask. It’s not unpleasant like Pure Shot or Pure Wood, but neither is it appealing. And for crying out loud – there are some delicious amber orange scents! Not nearly as good as Havane or Malt…agree. I was in the L’Occitane store in the mall today and everything she showed me was meh, the “reformulated” peony, the iris. Meh. Was really surprised they brought back that peony! Sounds like another Guerlain I can safely avoid… the only AA’s I’ve liked are Herba Fresca and Mandarine Basilic. Most meh? That’s a hard one. Probably Frederic Malle Portrait of a Lady (ducks tomatoes)… mostly because I was expecting it to blow my socks off, but when I smelled it, I thought eh — I’ve smelled a zillion niche roses like this one before! That was a meh from me too. Malle is meh to me..*ducks a few tomatoes too. * He seemed more business man than serious perfumer to me..ducks big tomatoes. I liked it, but wouldn’t say it blew my socks off either. This Aqua Allegoria did not impress. I tried it a few times, I do like the name and love tea scents, but it was so blah. Also in the blah or meh category for me is the new Malle Cologne Indelebile. Wow was that disappointing. I also thought the new Atelier’s via Sephora are pretty meh too. Frapin Nevermore – I had very high hopes for a perfume inspired by my favorite poet. Alas, it was just a soupy chemical mess on me. Somehow I find it even more disappointing when I don’t like a fragrance that seems made for me due to some connection (like a being inspired by a favorite poet/poem). Pander for the prestige market, you mean…they are not lowering their prices for this stuff! Yes – go get that No. 5!! And yes, please, let’s do a poll as meredifay suggests – a fragrance that smelled really good and you’re still wearing it. Doesn’t have to be a recently released fragrance, but one you recently found. I know we can always talk about that, but I’d love to read the answers in one long string from a poll. Happy Saturday, all! Actually, what I did do was order a 10 ml traveler of Iris Poudre from Barney’s online. This is the last perfume I wore that adorable hubby noticed with a “What’s that? You smell really good…” If I love it and my entourage enjoys it, (that is, hubby likes it and it does not annoy my co-workers) then that’s a keeper, right? Oh yes, it’s a keeper then. And I love Iris Poudre – an even better choice then the No. 5. Enjoy! Just added that question to this weekend’s poll! You are a doll, Robin! I recently tested the new Vilhelm Parfumerie fragrances at Barney’s and found them all to be very over-priced “meh”s. I also will add Mojave Ghost Byredo which I was hoping to like because of the name and concept of that ghost flower. That was more “ugh” than “meh” and, of course, it has unbelievable longevity. I just had a montage of meh running through my head, where nothing smelled outstanding and everything reminded me of things I wasn’t impressed with in the first place. Alas. And I never tried Tokyo, but if they were trying to get even more $ for this than what they’re charging for the Aqua Allegoria, that’s comical to me…. It’s true, Teazzura is a slightly tweaked version of Tokyo according to Monsieur Guerlain on his informative blog.